If I lived in Kitchener, Ontario, I would be heading straight to THEMUSEUM to see Getting Naked, an exhibition of more than 120 nudes from the Canada Council Art Bank collection. It looks like a really interesting show of works that aren’t often on display, and if you want to read a little about it, there’s a good review in the Globe and Mail. 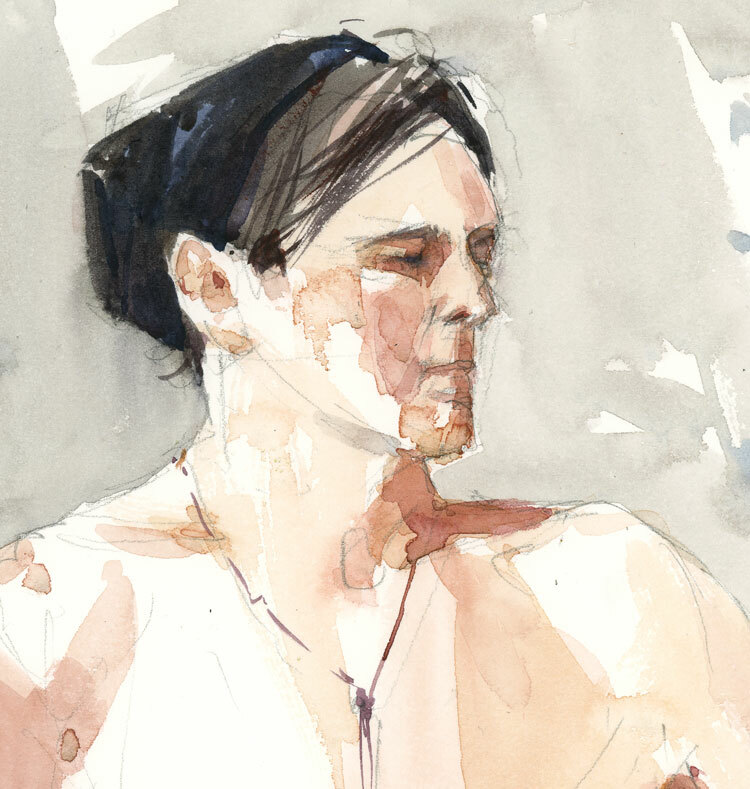 It might have helped to see the show before yesterday’s model session when I struggled to paint Christian. This week, instead of trying to draw the whole body, I focused on his head and shoulders. It seemed like a more manageable goal in the thirty minutes that I had. Thanks Shari, a point of interest… I actually worked for the summer in Kitchener and Stratford cataloguing those works for the Canada Council Art Bank back in 1972! That must have been quite a fascinating job Caroline. You should make the trip there to see the paintings. It really looks like an interesting show. Your faces are really improving. How was the likeness? The likeness was pretty good. He’s a very hard model to draw. He’s a very tall dancer with a very narrow face. Lovely sketch, you’ve really nailed the skintones.